This peak is #54 on the Height List for Nevada . 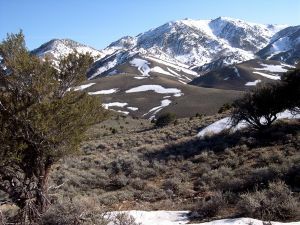 This peak is #71 in Prominence List for Nevada .Shoshone Mountain is the second highest peak in the Toquima Range in central Nevada. A dirt road leads to a pass called Jefferson summit north of the mountain. From here, the summit is a hike along the northeast ridge.